© 2012 by Marijane Osborn. All rights reserved. This edition copyright © 2012 by The Heroic Age. All rights reserved. Himes, Jonathan B., ed. and trans. 2009. The Old English Epic of Waldere. Newcastle-Upon-Tyne: Cambridge Scholars Publishing. 15 + 142 pages. ISBN 1–4438–0558–0. $52.99. §1. Waldere is a fragmentary Old English heroic poem that has been greatly neglected, not because it is "eclipsed by Beowulf" as Jonathan B. Himes suggests (3), but because it is eclipsed by its own mystery. Unlike Beowulf, in which the poet politely tucks the unfamiliar history in the poem into "digressions" where it may be ignored by those wanting to read monster fantasy or ferreted out and studied by obsessive scholars, in Waldere the historical context is crucial to our understanding but absent from the poem as we have it. Engaging a legend situated within a quasi-historical fifth century, the extant poem is composed almost entirely of three speeches, and if the third speaker were not named in the text, we might not even know what story lay behind the poem. That one name "Waldere" in line II.11 places the fragments firmly in the widely-distributed story of Walter of Aquitaine, and then, from what he and the other speakers say, we can further locate the situation in the poem within the plot of the story as it survives elsewhere. But much remains obscure, and Himes goes a good way towards leading us out of the darkness. §2. Before going further, the reader must be warned that this will not be the usual brief review. Partly due to the demands of the material and partly to the reviewer's special interests, the editors of The Heroic Age have kindly given permission for a hybrid essay combining a review of Himes's edition, mostly positive but including some reservations, with a supplement of materials concerning the fifth-century history that lies behind the story and the places traversed by the people in it. Himes's intention is "to elucidate how Anglo-Saxons handled legends from the heroic age in their own poetic mode" (xiii), and he attempts to "discern the cultural perspectives that Anglo-Saxons (and near neighbors familiar with their vernacular) read into this early heroic epic" (xiv). In keeping this focus Himes justifies omitting elements of the story that do not feature in the Old English poem in its fragmentary state,1 and what he discovers in close study of the manuscript and its language is the most satisfying part of his book. Yet the larger historical and geographical context of the story is pertinent and easily identified, and in this reviewer's opinion it greatly enriches the experience of reading Waldere. §3. Published by a press recently established by a group of Cambridge scholars (see their website: http://www.c-s-p.org/ ), The Old English Epic of Waldere is in two major parts with subparts and two appendices, as follows. Part I: Introduction: 1. Overview of the Text and Legend, 2. The Epic Fragments, 3. The Epic Hero, 4. The Epic Voices. Part II: Waldere: Text and Translation, Notes, Glossary. Appendix A: Weapons and Wargear, Appendix B: Heroic Vocabulary and Versification. A bibliography is included, but no index (even though one would be useful, and CSP press tells its authors that "with few exceptions all academic books should have some index"). In addition there are nine figures, eight tables, a costume plate that also appears on the book-jacket, two photographs, and nine original drawings by the author's brother, based on manuscript illustrations listed on p. xiv. §4. The book's title and the subtitles of Part I reveal the author's desire to identify Waldere firmly as an "epic," an investment that introduces controversy right away since the extant poem consists of only some sixty lines, and in the definition of epic, "length of composition is often considered an absolute" (Martin 2009, 10). My first reservation about Himes's project concerns this matter of genre. Himes argues strongly, on the same principles as others as far back as W. P. Ker in 1908 (88), that the nature of these two fragments indicates an epic poem of "more or less one thousand lines" (40), and he emphasizes the poem's "epic proportions" in the introduction (3) and Part I.3.1 (37–41). By then referring to Waldere as an epic throughout, Himes indicates that for him the case is settled. I too would like to imagine a much longer poem, but the case is not settled. As criticism of the somewhat similar and incomplete Old High German Hildebrandslied demonstrates, a poem about an epic hero (a status no one would deny to Waldere) need not be assumed to be an epic poem. In comparing Waldere and the Hildebrandslied, Himes states firmly that "both sets of fragments are quite truncated from their original length" (45), but Albert K. Wimmer claims that "although part of the beginning and the last parts of the Hildebrandslied are missing, it clearly could not have been much more than a hundred lines long" (1998, 15). Even concerning Beowulf, of which the length is not in doubt, modern scholars are more cautious than Ker was in their use of the term "epic" (Klaeber 2008, clxxxvii). I am not saying that Himes is wrong in identifying the missing poem behind the Waldere fragments as an epic, merely that it is inadvisable to speak with confidence about genre and length on the basis of such meager evidence. What may be said with confidence is that the story behind these fragments is heroic, and that the poem's audience is expected to be privy to a great deal of information about legendary heroes of the fifth century. This implicit context, some of which might have been revealed in the supposedly lost "complete epic" (38) or even in a briefer but intact poem, is a major part of what makes study of the Old English Waldere so fascinating. §5. A context both unfamiliar and missing means that in order to discuss Waldere at all additional material must be provided and explained. Of the several versions of the Walter story summarized by Himes (4–8), the Latin Waltharius is, as he says, the only one that presents the situation fully. In this long poem the hero Waltharius (Walter) and his betrothed Hiltgunde of Burgundy (Hildegyð in Old English) flee the court of Attila the Hun, where they have been well-treated hostages and Waltharius has proven himself a great war leader. (The Old English poem alludes to this background by calling Waldere Ætlan ordwyga, "Attila's champion," at line I.6). Another hostage named Hageno (Hagen), who is their friend, has fled previously. 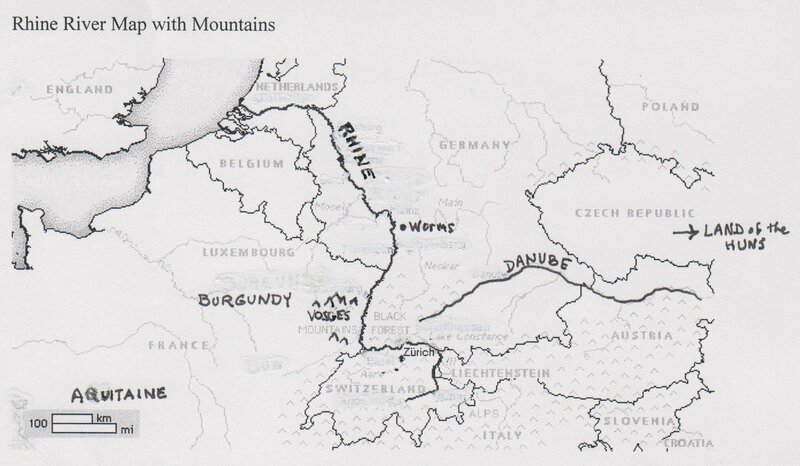 Carrying stolen treasure and equipment for surviving along the way, the pair sets out west along the Danube for their respective homelands in what is now France, but they are intercepted upon crossing the Rhine by Guntharius, ruler of the Franks (king of the Burgundians in Waldere). Mad for the Hunnish treasure, Guntharius is accompanied in the ambush by the reluctant Hageno, his kinsman and sworn follower, and eleven other warriors. The young couple has set up camp in the Vosges Mountains, just across the Rhine, when Hiltgunde sees armed warriors approaching and mistakenly assumes they are Huns pursuing them and the treasure. Terrified, she begs Waltharius to kill her lest she be raped, but he recognizes them and reassures her that they are local Franci Nebulones (Nibelung Franks, l. 555), his friend Hageno among them. Waltharius offers a portion of the treasure to pay for their passage across Frankish territory, and Hageno also attempts to keep the peace, but Guntharius, who wants it all, insists on fighting; that is, he orders his warriors, one after another, to attack Waltharius. Unlike the similar situation of Roland (whose fatal stand at the pass of Roncevalles was possibly influenced by this story), here Waltharius, taking up a position at the entrance (coram porta, l. 561) to a narrow defile between cliffs, bests them all. He kills off and beheads the Frankish champions, taking care that evening to collect the severed heads and place them beside their respective corpses (ll. 1156–57), a gesture of respect toward the slain. The next morning he fights Guntharius and Hageno until all three are brutally maimed. At this point, too exhausted and injured to fight any longer, they make friends and joke gruesomely about their wounds. At the end of the poem Waltharius and Hiltgunde ride off to Aquitaine, marry, and rule happily for thirty years. (For an analysis of the peculiar tone of this non-heroic ending, see Kratz 1980, 15–59). Three major points of difference in the Old English poem are allusions not only to Wayland the Smith but also to legends about his family, Hagen's gift to his friend of the famous sword named Mimming at a crucial point in the fight (Himes 9), and Waldere's faith in God and his concern with what is right. This concern with ryht, resembling that of Beowulf as he lies dying (see Knapp 2010, 96–97), and Waldere's certainty that God will help him, indicate a less gruesome and more serious—and appropriately epic—ending, in which our hero triumphs and Guðhere returns home defeated (Himes 53). §6. For a modern reader, the main anchor in this geographically specific legend is the highly recognizable name of Attila (Ætla in Waldere), ruler of the Huns and their empire from 434 to 453 CE. Attila is mentioned in the Old English poem only to remind us that Waldere was a valued war-leader in his army. The two other major characters named in Waldere having historical affinities are Waldere himself (Walter, Waltharius) of Aquitaine and Guðhere (Gunther, Guntharius) of Burgundy. These two share name-elements respectively with two fifth-century kings: Waldere with Wallia (or Valia), king of the Visigoths and a Roman foederatus in Spain who was later moved by his Roman superiors to Aquitaine (for details of the relocation see Goffart 2006, 119–186). The poet Sidonius Apollinaris (c. 430–489) celebrated Wallia as a hero from whom "the Vandals always turn to flight like cowards" (Carmina 2.348–370, qtd. Wolfram 1987, 444). There is general agreement that Guntharius (Guðhere, Gunnar in later legend) derives in some way from Gundohar of Burgundy, "the first Burgundian king of his clan who did things we know to be historical" (Wolfram 1997, 250). Wallia died in 419 and Gundohar was killed in battle by Attila's Huns in 436. As their dates make clear, the relationship of these important fifth-century rulers to the characters in Waldere is not exact (Himes 4); Wallia dies too soon and Attila's surge of power comes too late. As in the case of the Visigothic Brunhilde who, according to Gregory of Tours (d. 594), was married to the Merovingian king Sigibert in 565 (History of the Franks 4.27), it is the names and geographical associations that are picked up in later legend, not the actual persons; for example, the story surrounding Siegfried and Brünhild in the Middle High German Nibelungenlied derives from events a century earlier when the Roman general Flavius Aëtius (c. 396–455), who (like both Waldere and Hagen) had spent some time in his youth as a well-treated hostage among the Huns, in 436 led an army of Huns in Rome-sponsored offensive to destroy the Burgundian kingdom on the Rhine. This battle, where Gundohar was slain, was followed by "a pitiless act of ethnic cleansing" (Kelly 85; he says that more than 20,000 Burgundians were killed). Six years later Aëtius relocated the remaining Burgundians farther south along the Rhone, more or less where the wine-producing province of Burgundy is today (Wolfram 1997, 251; Kelly 193). In the later legends, hardly more violent than the actual historical events, it appears that the place of Aëtius was taken by the more famous Attila. So a historical background, however twisted it becomes, is probable for Guðhere and possible for Waldere; but no firm evidence exists that the third male character central to the action of Waldere's story, his old friend Hagen, has any historical affinity at all. He is best known in legend for his crucial roles in Norse poetry and the Nibelungenlied. In that German poem, it is Hagen who sinks the fabulous Nibelung treasure in the Rhine. §7. After Waldere, Guðhere and Hagen, the fourth main character in Waldere is Hildegyð, and to understand her part in the story it is necessary to proceed to Himes's discussion in Part I.4, "The Epic Voices." Although Hildegyð is not named (an Old English variant of her Latin name is supplied in discussions about her), Hines argues persuasively that she speaks the dialogue in Fragment I; by inciting Waldere to heroic action, she is playing a role traditional for noble women in Germanic story (56–59; on "whetters," see also Jochens 1996, 162–198). Hildegyð's speech is rhetorically strong (Andersson 1992, 21–22) and affectionate (wine min, l. I.12), and its forcefulness presents her as a far cry from the timid Hiltgunde of Waltharius. §8. To move to the identities of the other two speakers, that is, who is speaking what part of the poem, the only problematic one is the first speaker of Fragment II. After discussing the possibilities in detail (59–70), Himes concludes that the speaker is Hagen as he "gives [the sword] Mimming to Walter in a show of good will, just as Þeodoric intended to give it to Widia for freeing him from the domain of giants" (67; more about these people follows below). The imitative gesture that Himes finds here between these two gifts of the same sword at different times, Þeodoric's intended act of passing it on and Hagen's actual one, is intriguing, and Himes's argument is at times elegant. The argument nevertheless remains bumpy, and the translation on p. 81 seems to reflect this uncertainty with awkward syntax. It is probably impossible to be absolutely sure about the identity of this speaker, no matter how skillfully the case for any particular person is argued. The poet tells us clearly that the speaker of the last part of the poem is Waldere himself as he goads Guðhere then puts his faith in God in lines II.14–24. Thus the poem as we have it is mostly talk, but the fragments build toward what would be the climax of the story, with implicit in these speeches the two main themes of that climax: violence between those who should be friends, and Hagen's desperate crisis of loyalty. §10. This meeting in the Vosges occasions the most intriguing single word in the Old English poem, and Himes's story of his discovery of that word in Part I.2, "The Epic Fragments," is one of the highlights of his book. When Waldere is taunting Guðhere before they fight, he associates him correctly with Burgundy at line II.14, rather than making him a Frank as in Waltharius. In Himes's new reading Waldere refers to that Burgundian identity twice. He argues cogently that the almost obliterated word at line II.23 is Nifleun (or Nifle; discussion with photograph on 89–90), and when Waldere situates Guðhere among the Nifles, this word together with the earlier designation wine Burgenda at line I.14 creates an envelope pattern around his speech. These people are the Niflungs of Old Norse story and the Nibelungs of the Nibelungenlied, presented in these narratives as a ruling family of the Burgundian kingdom (rather than of the kingdom of the Franks as Waltharius makes the Nebulones). If Himes's reading is correct, this is the only time a reference to that famous dynasty appears in Old English. I applaud Himes's translation of the half-obscured word as "Nibelung" (18), making as much sense of it as anyone and giving us a reading that has us "sinking into the history" of that word, to borrow a phrase from Nabokov's novel Transparent Things.2 In addition to allowing us to locate the main characters' movements and their tribal affiliations, a map would be helpful for seeing how Himes's solution to this fraught and intriguing crux further locates the poem geographically while implicating Waldere more deeply into "epic." §11. The second surprise in Part I.2, "The Epic Fragments," is Himes's argument, based on anomalies in the manuscript, that the poet was himself a Frank. If this is so, he probably had a pretty good handle on local geographical matters and locally important names such as Nifle, and possibly was even aware of the brief tenure of the Burgundians in this part of France (now called Alsace). A historical Walter would have had to meet Gundatharius here between 413 and that king's death in 436—after which the Franks took over his territory. The Walter legend is so firmly attached to this area, in particular to the Vosges Mountains, that in the thirteenth-century German poem Biterolf (set in more or less the same time and place) Walter's sword "Wasge" even takes its name from the Vosges (Himes 67), as does the thirteenth-century double-castle Wasigenstein, built upon the rock face associated with Walter's heroic fight. If the poem Waldere was originally of any appreciable length at all, some form of the word Vosges would almost certainly have appeared in it, along with reference to that notable rift in which the hero protected Hildegyð, and his own back.3 These observations about the possibly Frankish poet and the Vosges location bring me to my third point of criticism of Himes's project: his assumption about the origin and transmission of Old English poetry that causes him to overlook an intriguing possibility. Himes supposes throughout that the Walter legend was handed down among the Anglo-Saxons. His opening statement of interest in how they "handled these legends" (xiii) implies this, and the assumption shows even more clearly when he claims that "Anglo-Saxon poets gradually amplified aspects of the legend" (101) and suggests that "Anglo-Saxon audiences may have celebrated [Waldere] even more widely than the protagonist of Beowulf" (37). There is no firm evidence that the hero Beowulf was ever known "widely" before Thorkelin, although the poet seems to have known a story about some such hero (cp. Bodvar Bjarki in Hrolf Kraki's Saga), and he certainly combined a great many widespread traditions to create his story (for a variety of examples see Osborn 2007). With similar skepticism one might ask this question concerning Waldere, proceeding directly from Himes's own interesting conjectures: if the poet was indeed a Frank, why is it necessary to assume that his Aquitanian hero, tangling with Burgundian warriors in a mountain range in northeastern France, was previously known to the Anglo-Saxons at all? §12. Theodoric the Great (named Ðeodric at line II.4) was definitely known to the Anglo-Saxons, a short stanza in the poem Deor being dedicated to him. Though legendary in the story world, where he appears widely, he is a major figure in the history of the fifth and early sixth centuries (d. 526). Waldere's father Ælfhere, named twice in the Old English poem (lines I.11 and II.20) and several times as Alphere in Waltharius (ll. 77 and passim) might have had some sort of historical identity also. But the remaining persons named in Waldere are purely legendary. The smith Weland (Wayland, Volundr) appears in Waltharius 964 as Wielandia, maker of the hero's chainmail. As forger of the sword Mimming (I.2–4) he has an expanded role in Waldere, and two others of his story are named in the compact allusion at the beginning of fragment II: Niðhad is the king who traps Weland to make treasure for him, and Widia is Weland's son by Niðhad's daughter. The story behind Widia's loan to Thidrek (Þeodric, Theodoric) of his famous sword Mimming, to which the speaker of lines II.7–8 alludes, is told in chapters 221–222 of the late composite Thidrek's Saga. The leisurely way the Anglo-Saxon poet pauses to introduce this legendary material that is ignored in the Latin poem is the main feature persuading many scholars that Waldere was once of epic length. This passage about Weland and the sword also corresponds to the lingering over the "genealogy" of weapons familiar in other Old English poems, such as, in Beowulf alone, Unferth's kin-slaying sword Hrunting, Hengest's sword "familiar among the Jutes," the sword that Beowulf imagines Freawaru's Dane wearing in the Headobard court, and Wiglaf's sword destined by its history to bring doom upon the Geats. Mimming gets as much attention as any human character named in the Waldere fragments, but in the second fragment the hero devotes almost as many lines to his byrnie when he dares Guðhere to come and get it (II.16–22). §13. Theodore M. Andersson observes that "what survives of Waldere is all about the accouterments of war, swords in the first two speeches and armor in the third" (22). Himes examines the poem's "Weapons and Wargear" in Appendix A, a lengthy (in terms of the book as a whole) discussion on pp. 97–117. Drawing mainly on archaeology, he produces an essay of particular value for anyone interested in early medieval weaponry, his aim being to examine "the material culture of the warrior aristocracy as represented in Waldere" (101). Himes points out, with examples in Table A–1, that the words for weapons and armor account for an amazing 19% of the nouns in the extant poem (99), and he discusses these in turn under nine subheadings: The Sword, The Mail-coat, The Spear, The Shield, The Helmet, The Bow, The Seax, The Axe, and The Treasure. Space prohibits more than two comments, linking this section to the translation. It would have been better to explain in a note or in this appendix what the poet means by beagas (I.29), rather than creating an unwieldy line in the translation to incorporate a gloss on the word (p. 79); and in regard to that disputed term geapneb describing Waldere's byrnie (II.19), Himes's "broad mesh" (109) seems a better choice than the "gaps riveted" in his translation (81). On the whole the translation might have profited by being closer to the wording of the original, except that ironically the one time when Himes is clearly making that choice, "forsook" for forsoc at line I.28, the word gives the wrong impression: Guðhere did not "forsake" (abandon) the treasure offered him, he rejected it. §14. Although I do not accept all of Himes's arguments about the poem, I admire the meticulous care with which he makes them and find his conjectures about a Frankish poet especially attractive and thought-provoking. I am less impressed by his translation, despite the several justifications he offers for his method (76). Although Himes claims that he alters the syntax of Old English only when necessary "to render the word order sensible in Modern English" (76), he changes agency in line I.19, and the syntax of his lines I.26–27 eludes me. At the vocabulary level, he creates confusion with his attempt to capture the sounds of the Old English phrase mæl ofer mearce ( I.19) with "melee over marches." Whatever that means, it is incorrect, and he translates the phrase better on p. 5. In translating mid unryhte (I.27) "with ill intent," Himes misses the opportunity to capture the poet's contrast of that phrase with ryhta gehwilces at II.26, although he pointed out the contrast on p. 45. To create a pun and imitate the repetition of beaga in line II.29, he adds an action, "upbraided," that is not in the original and results in a heavy line that is far from poetry. It pains me to say this, as a translator sharing many of the principles he states, but a translation that was faithful while grammatical and comprehensible would have been more appropriate for an edition of an Old English text than trying for "a more vivid reading" (76). Both Richard North and Scott Gwara offer better and more exact translations in recent work where they discuss Waldere (North 2007, 117–123; Gwara 2008, 368 and 370); North's partial translation even achieves elegance. It is interesting to see how differently their respective interests have led these three scholars to understand the phrase mæl ofer mearce. More recently yet the poet Matthew Hollis has provided "a more vivid reading" enhanced by clarity (Hollis 2011). §15. Appendix B is a discussion of "Heroic Vocabulary and Versification," and here Himes again brings up the possibility of French influence on the poem both in terms of vocabulary and story. It seems odd to find this important material appended rather than integrated into the earlier comprehensive "Introduction." Also, the discussion of the "lineage of heroes," with its table B–1 of proper nouns and an explanation about Hildegyð and her name (absent from the poem), surely belongs in Part I.3 about "The Epic Hero" or even before, maybe right at the beginning of Part I, rather than buried at the back of the book. The new reader needs access to that handy cast of characters as soon as possible. §16. Right at the end of his book, in the final footnote, Himes makes a clear error of fact when he claims that "John Niles's article 'Understanding Beowulf: Oral Poetry Acts' asserts that Beowulf was recorded from a performance for posterity for a literate audience, in order to document a poetic tradition whose gradual decline the Anglo-Saxons were witnessing" (131, note 13). Niles does not "assert" any such thing, nor, as a responsible scholar, would he. On the contrary, he says about his argument that Beowulf was an oral poetry act, "This is not a proposition subject to proof" (1993, 137). Throughout this article he uses expressions such as "in my view," "I suspect," and "could be," the like of which Himes could usefully add to his own vocabulary when discussing poetry of a remote age that tells fragments of a story even more remote in time. §17. Waldere is set in a period that for most people is the blackest hole in the so-called Dark Ages, that time when Late Antiquity overlaps with the Early Medieval period. Rome has "fallen" (or, more accurately, is petering out), and the later European nations we know today have not yet been formed. As Niles says in an article on Widsith, another Old English poem whose author was exploring these times, "Any people defines itself and its own cosmopolitan tendencies by looking backward over its shoulder, sometimes nervously, toward a period of more rugged origins" (1999, 202). The Anglo-Saxon (or maybe Frankish) poet of Waldere is looking back to heroic origins in a poem that is itself "rugged" in every possible aspect, from its Migration Age plot centered on a mountain fastness, to its fragmented survival and the condition even of those two decaying pages of vellum. I hope that in a revised and enlarged edition Himes might give more attention to the people and places behind this poem, an interest to which the poet himself invites us, even though that poet's concern was with the legend of confrontation and he had far less documented history to work with than we do (Drout and Kleinman, 2009). Although some might dismiss "looking behind the poem" as a romantic and even dated venture, when we might better be looking at what the culture in the poem meant to the later poet's situation (the concern with rihte, for example), in my view aligning the names of the figures of legend with historical people gives them additional dimension, just as finding that they stand on real ground does. Ironic quotation marks should be understood, of course, when speaking of "real" people in this context, since many of the sources from which we learn about them are not much more reliable than the poetry of legend. What Isidore writing about Wallia (History of the Kings of the Goths 22–24) and other chroniclers of the "barbarians" in the west chiefly do that is valid is to situate their kings and heroes roughly according to time and place. But even as we are aware of the limitations of the authenticating details of the stories in both poetry and chronicle, the names of peoples and locations they offer can engage us—in this case with a story that can also be read as a parable about the diffusion of elite goods (Attila's treasure) across Europe (cp. Himes 6 and 117), the disruption caused by that diffusion, and even the way elite transfer destabilizes kingdoms (Heather 2010, Chapter 6). §18. Himes, however, refuses to be distracted by the many questions the poem raises external to the text, and by the history that surrounds it. In confining his study "to matters of combat and the exploits of the heroes featured" (9, n.5), he has placed the two surviving fragments of Waldere into a context that makes sense of them in general, moving from close work on the manuscript to an archaeological survey of the weaponry to which the poet gives so much attention, and presenting the fragments with notes and translation between these two bulwarks. As J. G. Farrell said when asked why he wrote historical novels: "History leaves so much out . . . everything to do with the senses, for instance. And it leaves out the most important thing of all: the detail of what being alive is like" (Dean 1973). Himes may bog down at times, but in his attention to the concrete details of the poem, and even in some of the problems caused by his enthusiasm, he gets across the excitement about projecting "being alive" in the past that the poet seems to find. §19. Although I have focused heavily on what I consider lacking in this edition, that is because Himes has immersed me in the poem and its multiple problems as he approaches them from his selected angles. If the price were more modest, I would assign his book as a supplementary text for a course in early medieval literature and then devote considerable class time to drawing attention to the different ways into the text that Himes provides, and urging my students to "be alive" in the poem in Farrell's sense above. The very fact of Waldere's brevity would make it suitable for such exemplary use. Besides providing a brief but exciting (and yes, romantic) text in Old English with a handy glossary and much additional help, The Old English Epic of Waldere could be used to initiate discussion on a range of issues, including: the problem of the poem's genre and "how Anglo-Saxons handled legends from the heroic age" (xiii), and if it matters whether the poet is an Anglo-Saxon; gender issues, heroic "masculinities," of course, as these warriors taunt and agonize, but also comparison of the Latin and Old English treatments of Hildegyð; the materiality of a text and difficulties produced by time and decay, and the archaeology of portable objects mentioned in it; and great legendary events, barely mentioned, that the poet assumes we should know about in the mysterious fifth century. Finally, we would discuss how because of its very mystery the fragmented, dramatic Waldere, perhaps more than most other poems about legendary heroes, lures us beyond the poem into both a genuine real-world rift in the Vosges Mountains and an imaginary yet lived-in space that some might call "the past."